VATICAN CITY (CNS) — Christians always have hope, no matter how bleak, bad or uncertain the journey, because they know God is always by their side, Pope Francis said. 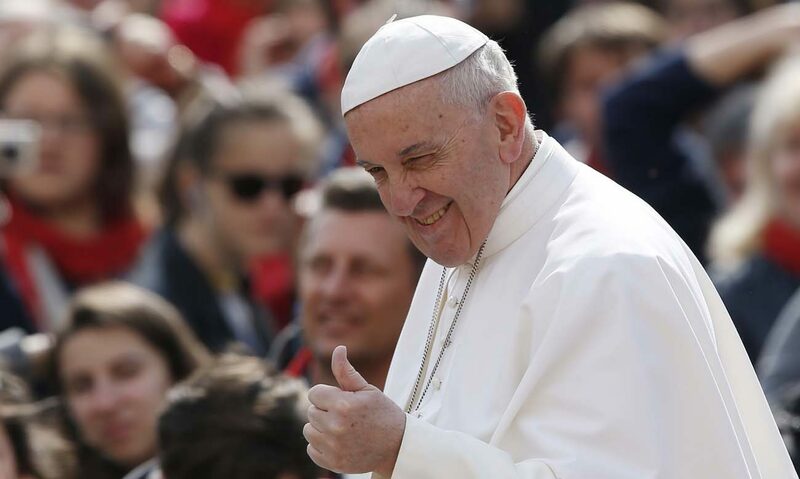 In fact, “even crossing parts of the world (that are) wounded, where things are not going well, we are among those who, even there, continue to hope,” he said at his weekly general audience in St. Peter’s Square April 26. The apostle shows how “ours is not an absent God, sequestered in a faraway heaven. Instead he is a God ‘impassioned’ with mankind,” so tenderly in love that he is unable to stay away, the pope said. In fact, the decisive moment between skepticism and faith is “the discovery of being loved and accompanied by our Father,” the pope said. Life is a pilgrimage, a journey in which “the seduction of the horizon” is always calling the human “wandering soul,” pushing people to go and explore the unknown, he said. “You do not become mature men and women if you cannot perceive the allure of the horizon — that boundary between heaven and earth that asks to be reached” by those who are on the move, he said. Christians never feel alone “because Jesus assures us he not only waits for us at the end of our long journey, but accompanies us every day,” even through dark and troubled times, he said. “Our life is anchored in heaven,” he said, which means “we move on because we are sure that our life has an anchor in heaven” and the rope “is always there” to grab onto. So if God has promised “he will never abandon us, if the beginning of every vocation is a ‘Follow me,’ with which he assures us of always staying before us, why be afraid then?” the pope asked. “With this promise, Christians can walk everywhere,” even in the worst, darkest places. Jesus promising “I am with you always” is what keeps the faithful standing tall with hope, believing that God is good and working to achieve what seems humanly impossible. “There is no place in the world that can escape the victory of the risen Christ, the victory of love,” the pope said. NEXT: To reverence God, take a knee — but which one?